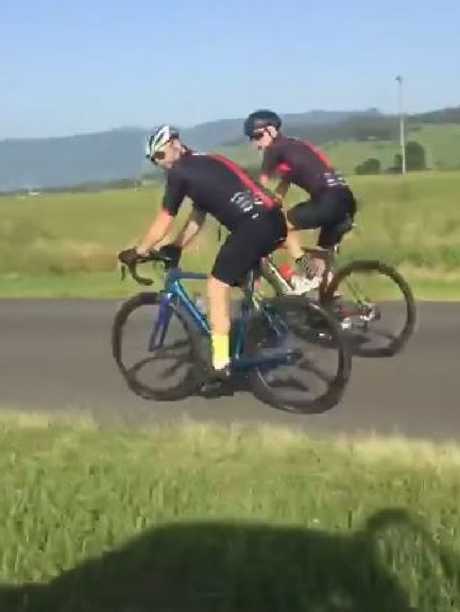 A FOUL-mouthed motorist has divided opinion online after overtaking two cyclists by swerving on to the bike path and hurling abuse at the riders who were spread out across the road. A video of the incident, which happened on NSW's South Coast, has been shared widely around social media and has attracted a lot of attention. 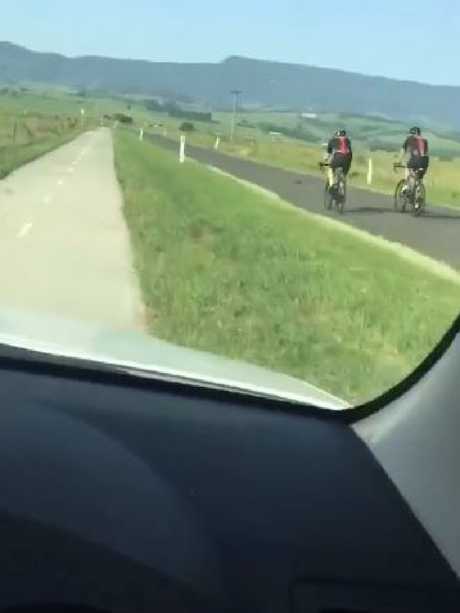 The footage shows the angry motorist driving along Swamp Rd, between Dunmore and Jamberoo, when he comes up to two cyclists riding next to each other on the road despite there being a bike path right next to them. The driver then swerves on to the cycling path and speeds past the bikers, screaming insults at them as he does so. "What's the point of us spending this money if you're not going to use it, you f***ing d**kheads," he can be heard yelling out the window. One of the cyclists yells back, telling the driver to "pull over so I can have a chat". But the irate motorist wasn't interested in talking, screaming "F**k off, f***ing idiot … use the bike track" before speeding away. On one post, made by Facebook page CarMafia and credited to Thomas Harris, the video has already been viewed two million times and racked up over 21,000 comments. Many social media users praised the driver for his expletive filled rant, with the Facebook page asking if anyone thinks he "deserves Australian of the year". "He makes a good point. Why ride on the road when there is a perfectly good bike path," one person said. The driver filmed himself speeding along the bike lane to overtake the cyclists. The driver’s actions have divided opinion online. "This accurately depicts what is wrong with cyclists and road rules," another said. One commenter likened the act to "p**sing in the garden when you could use the dunny". But not everyone agreed with the driver's actions, with some social media users slamming others for encouraging the abuse of cyclists. "Mouths off but doesn't pull over when confronted. You're tough bro," one person said. One commenter claimed the driver should have his licence taken away. "Video of some cyclists legally riding on the road and some nob in a car illegally driving on a pedestrian/bike path," another said. One person noted that many bike tracks are poorly maintained, making it "extremely uncomfortable to ride with a stiff road bike and can lead to punctures". It is legal for cyclists in NSW to ride two abreast so long as there is no more than 1.5 metres between them. However, according to the NSW Road Users' Handbook, cyclists "must use the bike lane where one is available". A cyclist caught not riding in a bicycle lane could get a $112 fine, while a motorist caught driving in a bicycle lane could get a $187 fine.